än som hatar kvinnor is a Swedish film adaptation of a book called The girl with the dragon tattoo which I've just completed reading. Strangely enough, this movie title translates to Los Hombres que no amaban a las mujeres (which in English, though there doesn't seem to be an official release date of an Englished subtitled version, The men who did not love the women). The book, part 1 of the millennium trilogy, I guess, starts slow. I've said it before and I'll say to you now, I love a book that begins with plopping the reader smack dab into the center of all the commotion no matter how confusing. This applies to movies too. Here's an explanation of what caught my eye to this title. At first, I must've stumbled upon it in a newspaper review and seeing that it was about journalism, I added it to my reading list. Next, the title intrigued me as I am developing an appeal for women born under the Chinese astrological year of the dragon. Still, these two factors may or may not have maintained my attention span as I began to read the slowest start I can remember. I kept having to convince myself that this book was worth reading if only because it's been suggested that the author did not suffer what most people consider a death of natural causes. A quick inference in the text of a news reporter referred only as She of TV4 reeled me in hook line and sinker, as this very description which I have yet to figure out why no name or face is paired with the character has me wondering if I missed something. Perhaps it is just the allure of reading a good book before it becomes part of the Opra book list that enticed me, but this book may never see the light of day in the Opra reading community as it might be termed a real downer in their views. Or maybe not. I feel the same way about gangsta rap music. Can't stand it. Can't say I ever have. 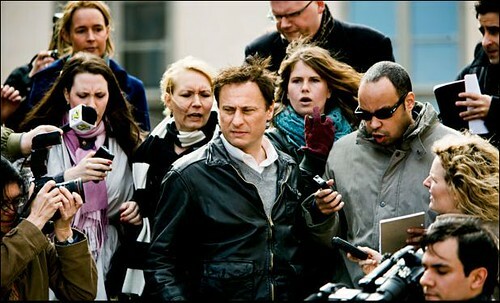 So I took a film clipping of a swarm of reporters chasing the main character for an interview. It is in this scene that I'm hoping She is revealed. Perhaps somebody reading this who has already seen the film and/or read the book can shed some light on the matter? I have this gigantic question mark hovering over my head and I fear it will obstruct people's view at the concert I'm going to this evening. An end to an otherwise perfect day.